Parmesan Onion Appetizer Squares is a recipe I’ve been making since I was a new bride, way back when. Whenever I serve them, they’re always a hit with their light oniony flavor, crispy yet creamy texture, and a tiny and unexpected touch of sweetness that everyone loves! This year (2018) I’ve decided to re-do this recipe and serve these Parmesan Onion Appetizer Squares (yet again) at our game day celebration. 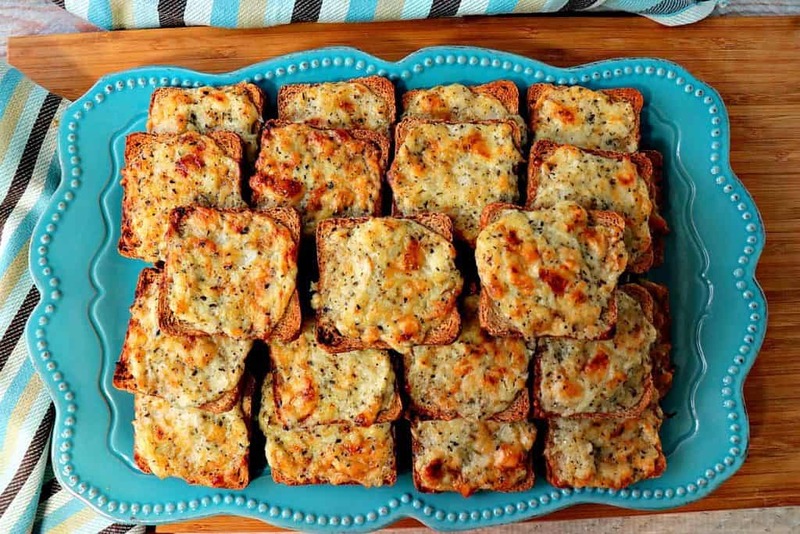 It seems whenever I’m planning an occasion when appetizers are served, these Parmesan Onion Appetizer Squares always make an appearance. And rightly so. **Please Note – The printable recipe card with detailed instructions, complete ingredient measurements, and nutritional information for making Parmesan Onion Appetizer Squares is available near the end of this post. 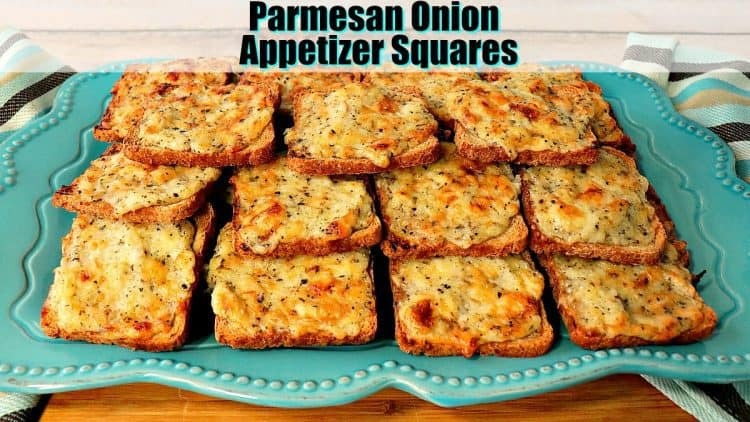 **The following affiliate links are some suggested products I’ve chosen that will aid you in the making and serving of this recipe for Parmesan Onion Appetizer Squares if needed. By clicking on the item photo, you’ll be taken directly to Amazon.com if you’re interested in purchasing any of these products. You are in no way required to do so, and you will not be charged in any way unless you decide to purchase one of these products through Amazon.com. As an Amazon Associate, I earn from qualifying purchases. Since I originally shared this recipe for Parmesan Onion Appetizer Squares in December of 2012, it would have been remiss of me to avoid addressing a horrible mass shooting that consumed our country only weeks before Christmas. Sadly, little did we know it, this type of senseless act of gun violence and killing would soon become relatively commonplace in our world. As we all gather this holiday season to give thanks and reflect on the year gone by, we do so with heavy hearts at the recent horrific tragedy in Newtown, Connecticut, at Sandy Hook Elementary School. My deepest love and prayers go out the families who have lost their loved ones (so many of them little children) in such a senseless act of violence that there can never be a sufficient understanding of. To be writing a blog post about some silly appetizers hardly seems like the thing to be doing right now, and yet, it is the return to normal activities that are so important at this time. Life surprisingly goes on, and whatever fear you feel must be squashed before it has a chance to consume your life. I return to my kitchen to find the solace I need and the comfort that keeps me safe and in control of my little corner of the world. The appetizer recipe I’m sharing today for Parmesan Onion Appetizer Squares is one I’ve been making for years. It’s a quick and easy recipe to throw together, and is always a hit with party guests as it’s full of flavor and tastes good hot out of the oven, or served at room temperature on a buffet table. Can Parmesan Onion Appetizers be made in advance? Yes! I even recommend it! However, it’s not the end of the world if it doesn’t happen. Mix up the spread in advance and refrigerate until you’re ready to spread it on the bread and bake. This can be done up to 48 hours in advance of spreading and baking. Can I substitute anything for the cocktail bread? Yes! Substitute a baguette, thinly sliced, or even crackers will work in a pinch. Where can I find the cocktail bread? I always find mine in the deli section of the grocery store. If you don’t see them readily, ask someone. I’ve seen them in rye and sourdough flavors. I’ve used both for this recipe. I’ve also left an Amazon affiliate link for the cocktail bread (above) if you’re unable to find them in your area. Mix everything in a medium bowl, except the cocktail bread. 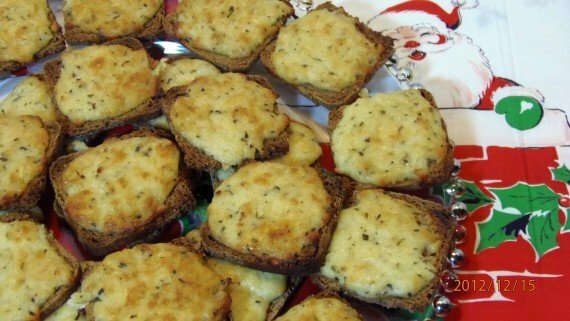 Spread approximately 1 tablespoon of the Parmesan mixture evenly onto the cocktail bread squares. Place them on a baking sheet and pop them into a preheated 400-degree oven for approximately 20 minutes. 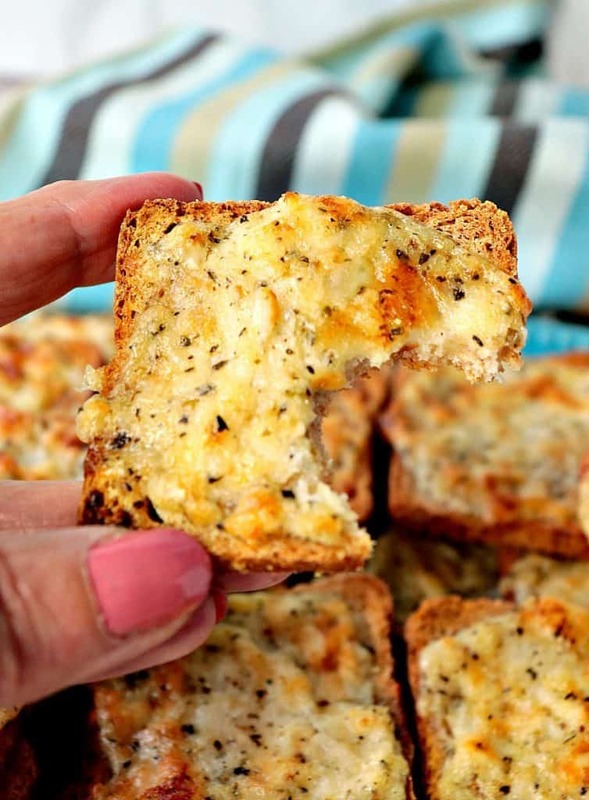 Parmesan Onion Appetizer Squares come out golden, creamy, crispy and can be served hot, warm, or at room temperature so they’re perfect for any sort of party! I love this recipe for Parmesan Onion Square Appetizers so much I’ve even shot my first “cooking-show” style video. I hope you enjoy the video and will subscribe to my Kudos Kitchen channel on Youtube. Below is the printable recipe card for today’s Parmesan Onion Appetizer Squares. Parmesan Onion Appetizer Squares are always a hit with their light oniony flavor, crispy yet creamy texture, and a tiny and unexpected touch of sweetness that everyone loves! Mix the first 8 ingredients together in a medium-sized bowl. Spread approximately 1 tablespoon of the Parmesan mixture evenly onto the cocktail bread and place on a baking sheet. Bake in a preheated oven for 20 minutes, or until the Parmesan Onion Appetizer Squares are golden in color. Remove and serve hot, warm, or at room temperature. I hope you’ve enjoyed this recipe for Parmesan Onion Appetizer Squares as much as I’ve enjoyed bringing it to you! Should you have any questions regarding this recipe or anything you see on my site, please don’t hesitate to contact me directly, or leave me a comment in the comment section below. It is always my distinct pleasure to get back to you with a reply just as soon as I possibly can! A classic…love this! Have you ever tried it with some dill in there? YUM! These look and sound fabulous! I love those little cocktail breads! That tray has my name on it…I'm sure you can see it if you look hard enough. And no, I'm not sharing. These look so good. I love little cocktail sandwiches. I LOVE these! I used to make a similar appetizer years ago; thanks for reminding me about them. They look so golden and delicious!! Quick and easy classic flavors! A winner! What a quick and easy recipe that everyone would love! It is so hard but so important to get back to a sense of normalcy after such a horrific tragedy. And I have to say you have shared a serious winner in my book with this appetizer. I love the flavours. Mmmm! I love oniony appetizers, and I think this looks fantastic! This is such a great looking appetizer. 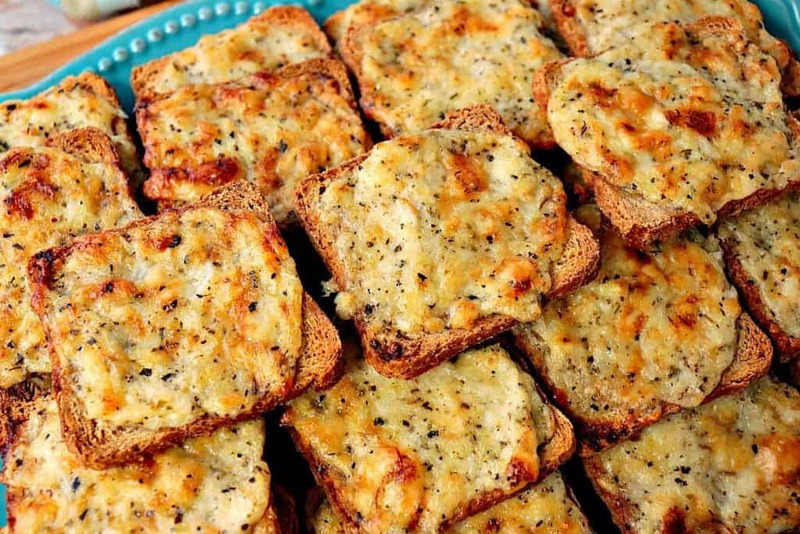 Oniony, cheesy and served on sourdough cocktail bread…what more could you ask for? Renee, I totally agree – I found it odd to post something happy and lighthearted in the wake of such tragedy, but we can't dwell on sadness. We have to move on and be grateful for the family and friends that we have in our lives. As for this appie – oh baby, that looks good! You can't go wrong with onion, mayos and cheese baked on top of carbs 😉 Happy holidays! These look so tasty! The perfect game day fare! They really are! Actually, they’re perfect for so many occasions. Enjoy! I can almost smell how good this is just looking at your photos! I can’t wait to try this recipe! Thanks! My pleasure. I know you’re going enjoy these! Silly question but I don’t know what constitutes “cocktail bread”? Not silly at all because, sadly, cocktail bread is not widely recognized. It’s a small loaf of bread (I find mine in the deli section of the grocery store) and the slices are like 2″ x 2″. Ask in the deli section and they’ll be able to help you. I also left the Amazon link for a visual (or to purchase) if needed. However, you can substitute thin baguette slices or probably even crackers if needed.